01. Affinity diagrams are useful tools to help analyze and solve what type(s) of problems? 02. Which of the following is a primary reason for periodic project reviews? 03. 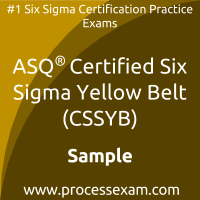 Six sigma project methodology normally begins with what initial step? 04. When selecting a project, priority should first be given to a project that? 06. Which of the following management tools requires the least preliminary knowledge about a subject or activity? 07. There are a large number of potential human errors. What are possible countermeasures for inexperience? 08. Community or society quality benefits resulting from a business enterprise would include which of the following? 09. Which of the following management tools could be used to rate the factors necessary to pass the CSSYB exam? 10. A scatter diagram in which the points plotted appear to form an almost straight band that flows from the lower left to the upper right would be said to display.